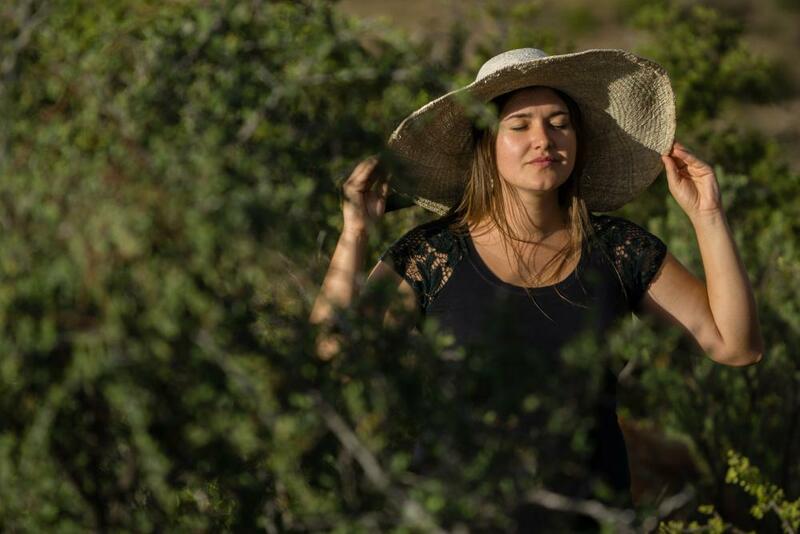 Daréll Lourens of The Good Holiday invited Louise De Waal of Green Girls in Africa, Alfred Thorpe of Let There Be Light, me and a few others to join her on assignment in Cape Nature’s Gamkaberg Nature Reserve near Oudtshoorn, as she shot their new promotional video. We road tripped from Cape Town and it was fun spending a few days on set (especially as I had very serious aspirations of being an actress when I was younger). The surroundings made for a beautiful natural backdrop, as we spent the next few days with early wake up calls, lounging about during the day (when it was too bright to shoot), napping on lazy hammocks, cooling down in the pool and then heading out to capture the splendour of golden hour. Here’s the article I wrote for Mango’s in-flight magazine Juice. It takes a few days to adjust to Gamkaberg’s pace, but a week or so should be enough time to align yourself to nature’s clock, and if you tread lightly, its natural wonders come into focus. There’s no better time for a drive than at 5am, right? Well, on any other day I’d be hesitant and would object, loudly, but today is not just another day and it’s no ordinary drive either. We’re making our way up the 16km-long Zebra Crossing 4×4 route that ribbons its way through the fields of fynbos of Gamkaberg Nature Reserve, up and around, to the 1 105m Bakenskop look-out point and beyond to the wooden cabins at Oukraal. 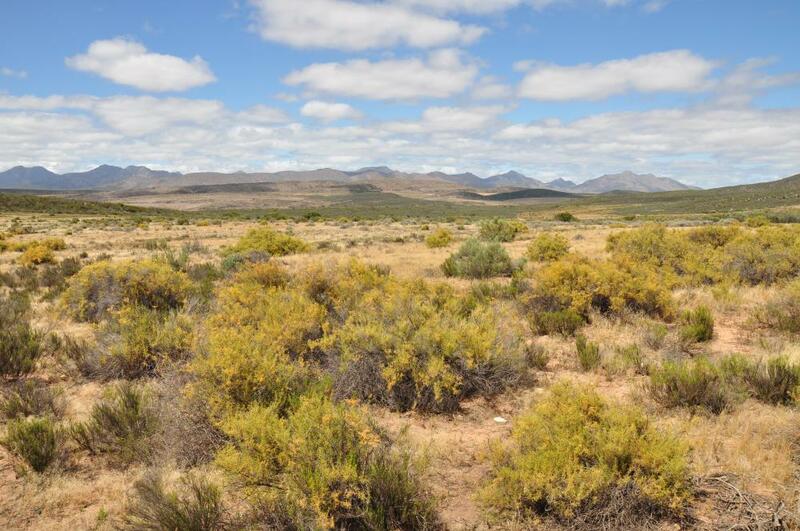 This is big sky, Klein Karoo country. 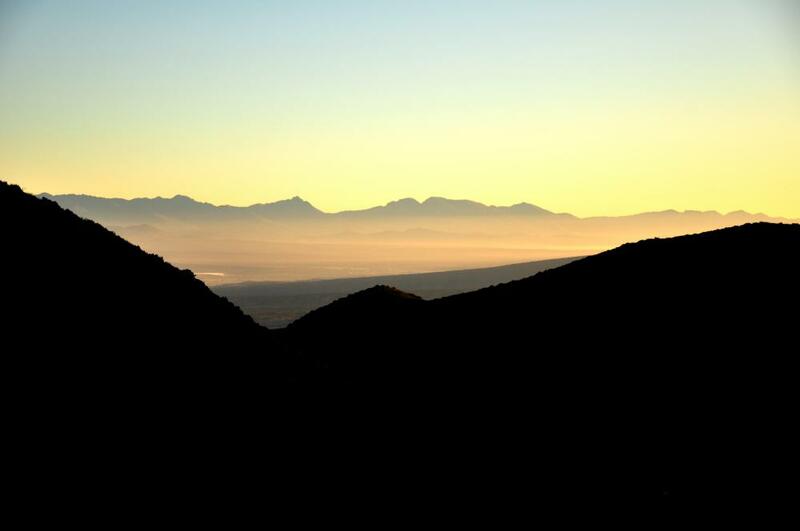 The Swartberg Mountains are as far as I can see. They appear to have been moulded from clay by a child – with uneven peaks here, and thumb prints there. The mountains are an impenetrable wall of rock that hide the true horizon from sight. Past the interlocking spurs, which still sleep in shadow, light trickles into the valley – sunrays fill it like water in a measuring jug that inches its way higher and higher. A wooden table and bench at Bakenskop make for a breakfast view that’s hard to come by. It looks out, down a precipitous fall, across the shrub-shrouded ravine to the river that’s almost hidden from sight. Though we’re standing on the highest point, it’s impossible to see the 10 000ha the reserve covers, although it helps me better imagine the size of the 80 000ha conservation area of which it’s just a slice. Last July, Gamkaberg, which is part of Cape Nature, received UNESCO Natural World Heritage Status for being one of the most bio-diverse places on earth. 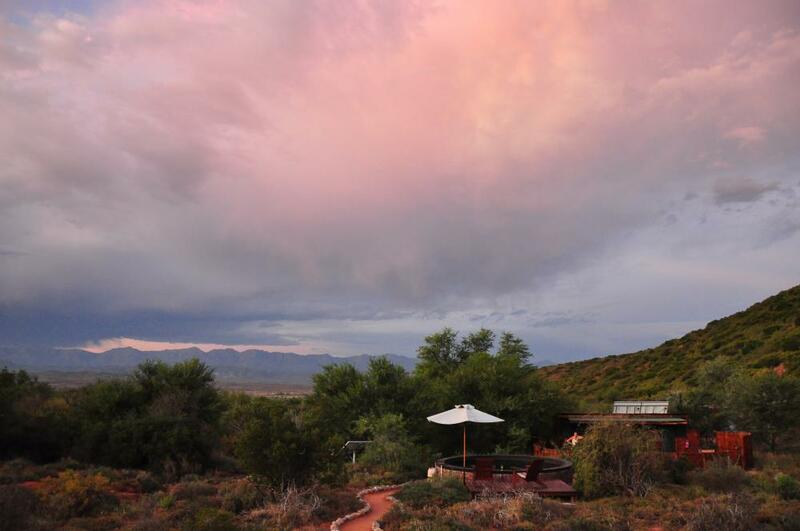 “It covers five biomes – Fynbos, Renosterveld, Succulent Karoo, Subtropical Thicket and Evergreen Forest – and is continuously named in the top 10 most diverse places in the world,” Tom Barry, the reserve manager who has worked here for 22 of the 26 years of his career, tells me. The reserve was established in 1975 to protect a herd of seven endangered Mountain Zebra, today there are over 50 animals – that doesn’t make them any easier to find though. ‘Gamka’ derives from the Khoi word ‘gami’ that means lion, but you won’t see any here. Around 45 leopards roam in and out of the reserve, but don’t let that discourage you from doing the two-day Tierkloof hike or one of the shorter hikes, because they’re really hard to spot. Although The Cape Leopard Trust tracks the leopards’ movements, as part of their conservation efforts, you’re more likely to tick a leopard tortoise off your check list as they journey to the lodges’ ground-level bird baths. Gamkaberg is after all a nature – not a game – reserve. And so, to get a sense of this place, I abandon the check list and my hopes of seeing a jackal or caracal, and instead become an observer of small things: the sugar birds, clapper larks, some of the 220-odd other bird species, and even the rare armadillo girdled lizard. It takes a few days to adjust to Gamkaberg’s pace, but a week or so should be enough time to align yourself to nature’s clock, and if you tread lightly, its natural wonders come into focus. Not least of which is that the reserve is environmentally friendly and has a minimal carbon footprint: the lights and geysers are solar-powered, the amenities are biodegradable, while the dry compost lavatories drastically decrease water usage. Better yet, it was named Top 50 Most Sustainable and Responsible Tourist Destinations on the continent by Africa’s Finest. 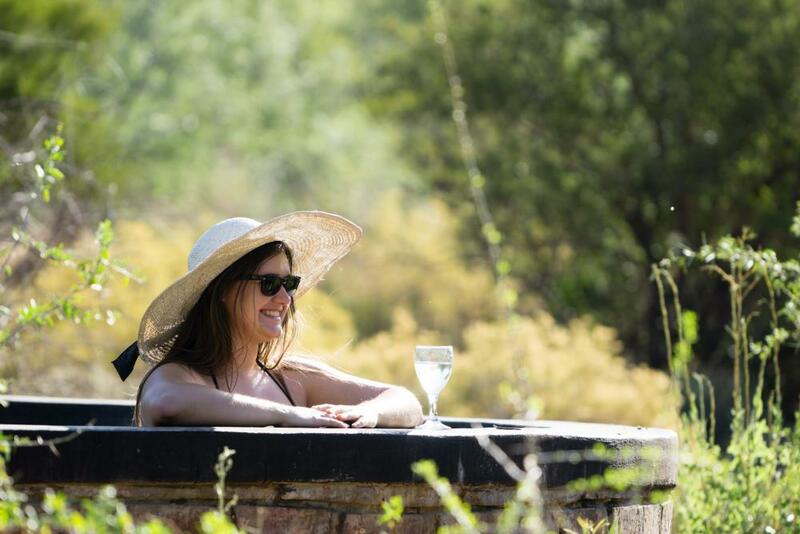 By late morning we’re back at our lodge, but at this time of the day, the Klein Karoo heat makes any task difficult to complete, unless it’s drinking a glass of Chardonnay in the plunge pool or taking a siesta on the hammock or in your safari tent. As I read beneath the parasol on the wooden deck, I watch reflections of unfurling clouds pirouette across the surface of the plunge pool, but they leave me with empty promises of rain. The landscape has a way of turning your thoughts inwards and towards the people whose company you share. It leads to a realisation of how little you need to simply be. The heat dissolves and we bid farewell to the sun with a picnic atop a koppie overgrown with spekboom (which interestingly enough translates to ‘bacon tree’ from Afrikaans). Tom calls it the miracle plant as he explains that an adult plant has the same carbon dioxide reduction capabilities of a large forest tree, which makes this indigenous succulent a symbol for climate change awareness. Planting 10 hectares of spekboom is equivalent to taking 26 cars off the road for a year. Daréll did a photo shoot for each of us (to remember the trip by) and this is my favourite. In this photo, I’m standing atop the koppie amid a spekboom ‘forest’. As the wine flows and the moon rises, we turn our attention to the other side of the koppie and do a full moon rising dance – perhaps like the Khoi, who lived here thousands of years ago, except a little less co-ordinated. There are around 100 examples of Khoi-San rock art within the reserve that date back 2 000 years. They depict pregnant women, soothsayers in trance, and collections of fingerprints that archaeologists believe record important life event such as hunts, rainfall or births. They’re not accessible to the public, to preserve their integrity, but should you happily happen upon them marvel at their life and times. We start the bon fire long after the insects have come to life with song, and make what starts as a seafood potjie and ends a seafood-potjie-paella. As the chatter quietens, it’s the glowing embers, not a watch, that signal bedtime. In a word Gamkaberg is slow, I’ll be returning here to… pause. And’s here the final cut of the video to give you a sense of place. When did you last spend a few days in nature, away from the distractions of the modern world? Please tell me about your experience in the comments below. If liked this post, please PIN it for later! we were there 20 years ago. I remember a pale chanting goshawk in a tree near our shoulders. And the Kory bustard flying away in protest, complaining bittterly about our intrusion as he flew away along the valley. Thank you Suzanne, it’s a great place to reconnect with nature! :) You can find the contact details at the bottom of the post, if you decide to go. Great article and such stunning photos by both you and Darell!